Bring All offers, a true classic with many recent upgrades. Needs some work, but could be magnificent. All offers considered. New Navaigation Gear Decmber Running Gear Refurbished December Bottom Done December This is a serious boat for serious cruising, bring all offers. Cruisers, liveaboards, lovers of massive boats. This one is for you. Nothing beats a displacement hull for ride, quiet and beauty. Designed by James Krogen, custom built in Miami, this 63 footer is ready to take you anywhere you choose to go. The clipper bow, displacement hull, portuguese bridge, stabilizers, big fly bridge and roomy interior all add to up to a versatile boat that will shy away from nothing. The big open bow, with windlass, leads to covered, wide side decks through the portuguese bridge. There is plenty of room for line and fender handling. The aft deck is protected by wing doors and solid weather screen from handrail to toe rail. Double doors lead to the salon and a ladder to the big flybridge. The fly bridge is set up for entertaining, relaxing and serious navigation. There are three adjustable seats at the fully equipped helm. The visibility is fantastic. There is plenty of storage under the bridge. A bimini top protects the helm. Twin lounges with tables are port and starboard. Seating is ample for eight to ten adults. There is plenty of deck space for sunning or adding more seating. An inflatable dinghy, with outboard, is stored over the aft deck. The pilothouse is entered from port or starboard. A nicely laid out helm with centerline wheel will make for pleasant navigation in all weather. There is plenty of storage for essential gear and a comfortable couch/captains berth. The electronics are extensive and include: Raytheon RC520 Plotter Garmin Plotter Raytheon Pathfinder Radar Raytheon ST + Auto Pilot Sandpiper digital depth finder Dol Fin stabilizers There is also VHF and SSB radios, magnetic compass and the usual safety equipment found on a proper yacht. The breaker panels are located in the pilot house also. A stairway leads forward to a double stateroom with en suite head. Rich woodwork makes for a classical feel. There is a storage room and engine compartment access from this level. Twin Cat diesels with about hours ,Onan 4.0kW generator and ships systems appear in good working order. Back on the main deck, a hall leads aft with the galley being the first stop. Fully equipped and plenty of storage make this a very functional space. Twin refrigerator freezers, stove, oven, microwave, twin sinks, dishwasher. Big windows make it seem open and airy. 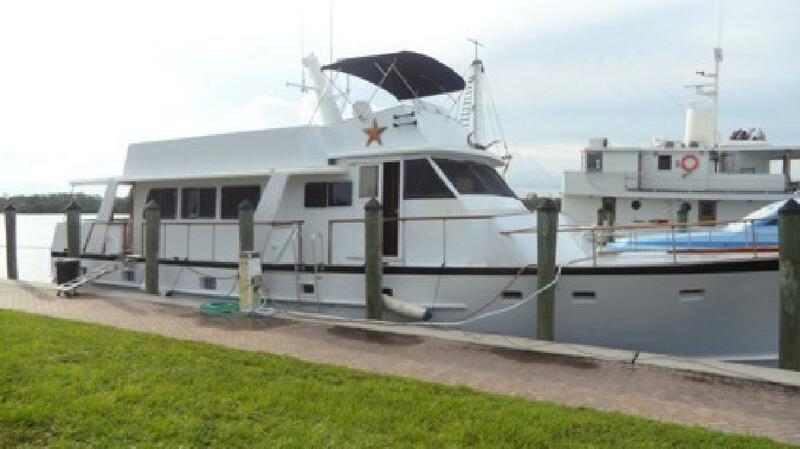 This may work as a charter boat galley, and easily as a long range cruiser or liveaboard. Moving aft to the salon. Windows on three bulkheads and double doors open to the aft deck. Nice wood paneling and deck. There is a large couch to port and rattan chairs with table to starboard. A table with chairs is forward to port, and a stairway to the berthing area is midship. Not flashy, but classic, timeless comfort and beauty. The curved stairway is protected by a nicely designed bannister. Three staterooms are found on this level as well as a couple of full heads. The master is aft and has a centerline berth. There is lots of storage, plenty of light and ventilation. The other two staterooms are doubles and are opposite on the centerline hall. Overall this is a pretty nice boat. Plenty of style, great design, well constructed and loads of possibilities. Bring offers as the owner is ready to move on. Boat is in Florida.